Lac is a natural substance that is the secretion of the Lac insect "Laccifer lacca", which is found on certain tress principally in the provinces of India and Thailand. The lac insect, in the larval stage, is about 0.5mm in length and sufficiently mobile to crawl along the branches of the trees to find fresh succulent twigs. When it has fixed its position it secretes a protective coating consisting of a deep-red scale and a yellow to reddish resin called Lac. Its life cycle is about 6 months with most of the resin being secreted by the female insects. The substance is collected from the trees, cleaned and harvested into bags. The bags of harvested lac are heated over an open fire and as the lac melts, the bags are squeezed so that the lac is forced to the outside surface of the bag. This process forms sheets of shellac which are then crushed into flakes for storage and despatch. 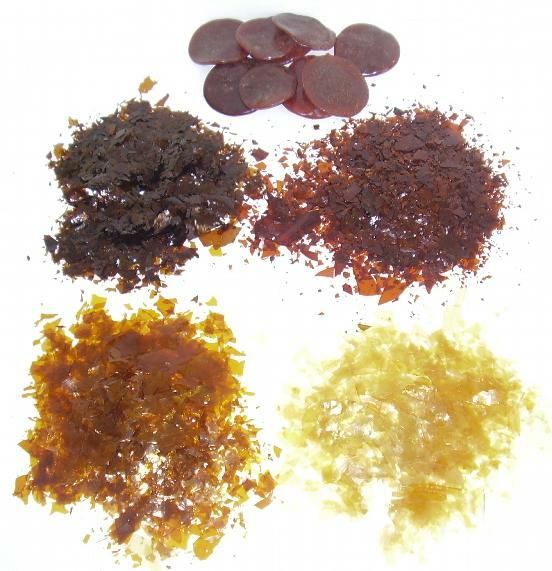 The dissolving of shellac flakes in alcohol is the most widely known use of shellac and forms the basis of French Polish. 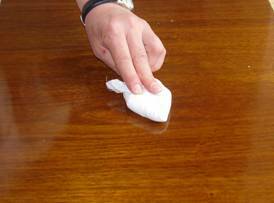 No resin has yet been found which so enhances the natural beauty of the grain of wood. 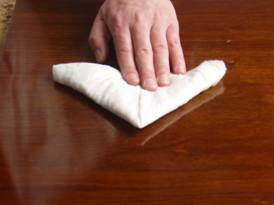 The technique of applying shellac by rubbing it onto the furniture with a "rubber" is widely regarded to have begun in France in the early 1800's, hence the description French Polish. Shellac is not only used to produce French polish, it has had a distinguished history of coating many different products. 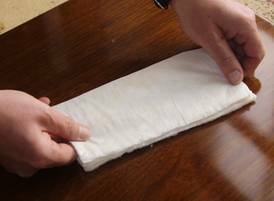 Fold the twisted ends of the cloth over the pad to fashion a handgrip, leaving a smooth, crease-free sole. 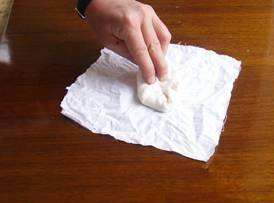 The polish is applied by opening the pad and charging the cotton wadding with approximately 4 tablespoons of polish. 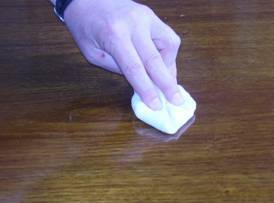 Ensure that you avoid dipping the rubber directly into the polish and do not pour it onto the sole of the pad. Close the rubber and squeeze out any surplus. Putting pressure onto the rubber allows the polish to seep through onto the surface. Raw linseed oil can be smeared onto the sole of the pad so that the rubber runs smoothly. The rubber should be recharged when necessary and the entire process repeated until the grain is filled. This is what is termed as 'bodying up'. In most cases this will be the final stage, which is designed to burnish the polish to a high gloss. Use thinned down polish to a ratio of three parts 2½lb polish to 1 part Methylated Spirit. 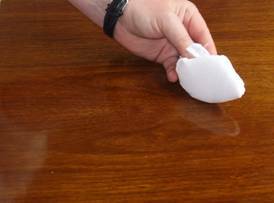 Charge the rubber with the thinned polish and using very light pressure, apply the polish in straight very slightly overlapping strokes along the length of the grain. The stroke must be very straight or you will produce an arcing pattern to the finish. When all the pieces have been treated in this way, wait a few minutes and then repeat the sequence. 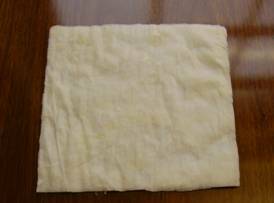 This time you should feel a very definite pull as the surface film is partially dissolved and pulled flat by the rubber. The resistance to the rubber's movement may tempt you to speed up; this must be avoided as the surface will be 'burned'. For the best results slowly pull the rubber over the surface. If you have any problems wait for a time before starting again. Stop when you have achieved a high, even gloss. There may be some blemishes, such as minor rubber marks. These will normally disappear as the surface hardens. If not, repeat the spiriting process after a few hours. 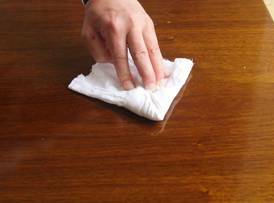 French Polish can also be brushed onto the surface and it is recommended that a good quality polishing mop is used (either an S&R squirrel or zorino).